I am quite proud of the work that we did on EveryDesk – a full desktop as a bootable USB key, fully modifiable and adaptable. We are using it in schools, public administrations and companies, where the increased efficiency of Linux makes a difference in making old computers usable again – or helping in the problem of managing PCs that are remote or in hostile environments. However, this is not enough. You may be without a USB-bootable computer, or you may be using a tablet like an iPad or a Galaxy Pad (something that I see more and more everywhere). In these environments, you may need something more powerful than the apps that are available there – a full Office-like application, or a real desktop browser to access a corporate banking application; maybe you need a specific client for older systems, like the IBM iSeries (the old AS/400) or some special client in Java – on system that do not have java or flash. For this kind of applications, we are working on a system that embeds a full HTML5 desktop in a FaceBook application, making it accessible from any recent web browser, including the iPad. This way, you can have a full desktop everywhere you go. We hope that it can be of interest; as soon as it is ready, we will release source code and blueprints. We have prepared a small demo of how it works right now; it is a real screen capture from my own personal EveryDesk/Online instance, done on a normal ADSL line. It should give an idea on how it may work for you. The Jury for the Demo Cup – the international competition for Open Source projects being organized as part of the Open World Forum in Paris on 1 October 2010 – has published the list of finalists, following a tough selection process based on entrants’ submissions. The Open World Forum is the world’s leading summit meeting bringing together decision-makers and communities to cross-fertilize open technological, economic and social initiatives to build the digital future. Its Demo Cup showcases innovative and game-changing Open Source products of the year. These 13 finalists will compete against each other on 1 October 2010 from 2:00pm to 4:00pm at the Open World Forum. Each will have exactly eight minutes to convince the Jury and the audience, by putting forward a practical demonstration of how their product might become a game-changer in their marketplace. Following these presentations, the Jury will present five ‘Open Innovation Awards’ which will recognize the most spectacular and convincing demonstrations. The Demo Cup Jury includes investors, entrepreneurs, Open Source managers from leading IT services companies, and consultants; all of them experts in Open Source and innovation: Larry Augustin (SugarCRM), Jean-François Caenen (Capgemini), Jean-Marie Chauvet (LC Capital), Stefane Fermigier (Nuxeo), Jean-François Gallouin (Via Innovation), Roberto Galopini (consultant), Thierry Koerlen (Ulteo), Jean-Noel Olivier (Accenture), Bruno Pinna (Bull), Alain Revah (Kublax). The 2010 Demo Cup is organized by the Open World Forum, with operational support being provided by the Open Software Special Interest Group of the Systematic competitiveness cluster. For more information, visit: <http://www.openworldforum.org/connect/awards/awards> or contact Stefane Fermigier at sf@nuxeo.com. The Open World Forum is the leading global summit meeting bringing together decision-makers and communities to cross-fertilize open digital technological, economic and social initiatives. At the very heart of the Free/Open Source revolution, the event was founded in 2008 and now takes place every year in Paris, with over 140 speakers from 40 countries, an international audience of 1,500 delegates and some forty seminars, workshops and think-tanks. Organized by a vast network of partners, including the leading Free/Open Source communities and main global players from the IT world, the Open World Forum is the definitive event for discovering the latest trends in open computing. As a result, it is a unique opportunity to share ideas and best practice with visionary thinkers, entrepreneurs and leaders of the top international Free/Open Source communities and to network with technology gurus, CxOs, analysts, CIOs, researchers, politicians and investors from six continents. The Open World Forum is being run this year by the Systematic competitiveness cluster, in partnership with Cap Digital and the European QualiPSo consortium. Some 70% of the world’s leading information technology companies are involved in the Forum as partners and participants. 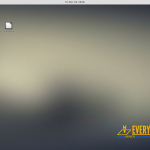 I am quite happy to announce the release of the third beta of our EveryDesk flash-based desktop, now available in VirtualBox format as well – so you can try it out without the need of a USB key. EveryDesk is a reinterpretation of the Linux desktop. 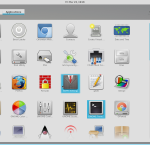 It executes from a 4Gb USB Key, and allows the user to run a modern and efficient Linux Desktop on most PCs without the need of changing or removing the native operating system such as Windows. Designed to be used in Public Administrations or as an enterprise desktop, EveryDesk is a real OS on a USB key, not a live CD, and as such allows for extensive customization and adaptation to each Public Administration need. 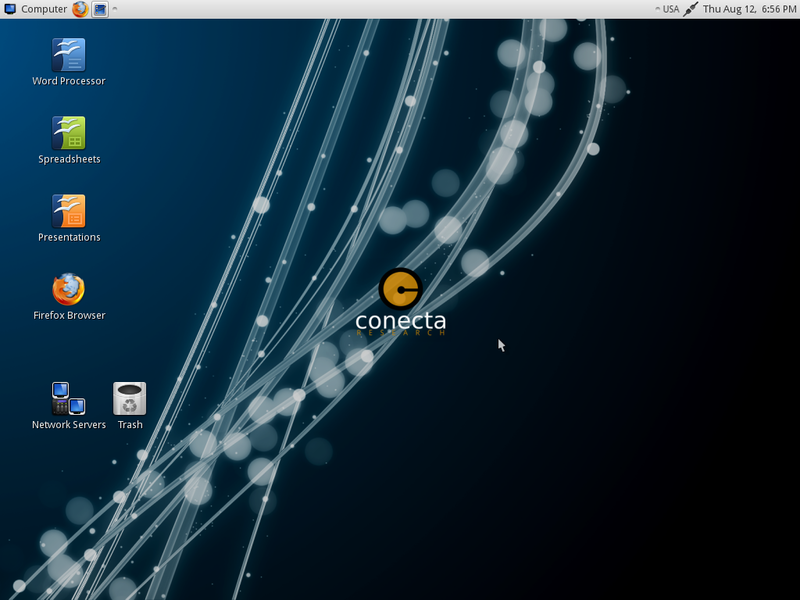 It is the result of the open sourcing of parts of the Conecta HealthDesk system, designed using the result of our past European projects COSPA (a large migration experiment for European Public Administrations), SPIRIT (open source health care), OpenTTT (OSS technology transfer) and CALIBRE (open source for industrial environments). 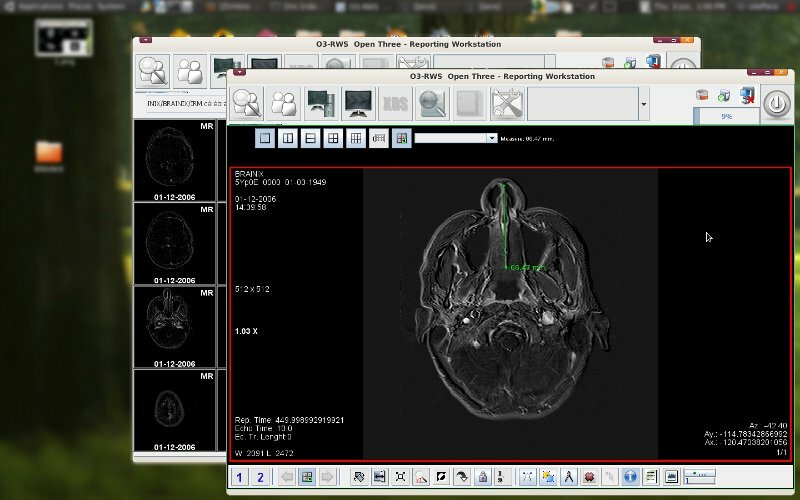 Latest edition of the DICOM browser for hospitals and medical applications; now supports per-user monitor calibration. To facilitate the final bug fixing, we made the boot process visible – that will be reverted to silent boot as soon as the final testing is completed. 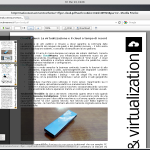 As usual, you will find the images at our sourceforge page. We have finally released the new version of the linux-on-USB EveryDesk system, both in the plain version and the Medical release, that includes an IHE certified DICOM medical image browser, a complete R-based statistical environment and OpenOffice enhanced with a complete medical dictionary. The new version is faster, should be more compatible with older hardware, and in general was found by our beta testers to be fairly complete. Its main appeal is that it can be tested without any installation: just download the image, copy it on the key and try. It boots fast, it is totally modifiable, provides local applications, Prism for web-apps, Chromium and several remote computing applications like the VMware View client, clients for IBM mini and mainframes, a full Java environment for Citrix, and much more. The medical version still misses the final DICOM certification (you will see in the startup splash screen that it does have no CE marking), we are working towards the final release that will be certified and significantly improved. The R environment is also missing some modules specific to bioengineering, that were not ready in time for release; we expect to have a beta-2 version ready for the mid of august. We have also a completely new website: http://www.everydesk.org where we added a substantial amount of material, and will be used to publish the training videos that we are preparing to help companies in adopting the desktop for their own internal use. We have introduced a new policy: we offer unlimited and free support and helpdesk services for all users, commercial or not. To receive private answers we only as for an introductory email that provides details of the institution, contact points and the actual or expected number of EveryDesk installations. We will provide a separate customer ID, and it will be used for issue tracking. Large scale customers can request a private portal, with issue and bug tracking, device management and group update as a separate commercial option. We are welcoming health care institutions that are interested in trying EveryDesk/MED, especially from developing countries; let us know what additional application may be of interest to be added to the default platform. Now that our EveryDesk is out in the wild, I would like to provide a little background on what choices were made in creating it; especially outlining some differences with previous approaches. EveryDesk starts with a set of assumptions: first of all, that every single barrier reduces by an order of magnitude the probability of adoption, and that it is extremely difficult to displace “what works”, but there are lots of environments where current OSS and commercial offerings are not perfectly suited for their intended target. I have previously addressed the use of the UTAUT model to study for example Google’s ChromiumOS offering; we applied the same model for our own desktop offering, modelled after the end of the COSPA project (one of the largest controlled experiments in the introduction of OSS in European Public Administration desktops). We have focused our initial efforts on the Health Care sector, thanks to our contract work with the regional health care agency of the Friuli region, but later generalized the approach for a wide range of activities using the same basic infrastructure. First of all, what’s the problem of the current commercial offering? Management: unless you are the lucky recipient of a fully managed (and costly) infrastructure, you will have to perform or have performed several management activities like patch and software management, backups and lots more. Thin clients reduce management, but require substantial infrastructural investments, some applications are hard to port to Terminal Services or require substantial remotization bandwidth (or lots of additional software: think about video-conferencing in a TS environment, with all the hybrid local/remote channel enabled by tools like Citrix HDX). VDI requires even more complex systems, with an offering that is still maturing (with some stunning technical hacks, actually) and that has for many installation an unproven return on investment. To summarize: desktop PC are flexible, adaptable, usable without connectivity, complex, fragile, difficult to manage. Thin (bitmap-based, like RDP or ICA) clients are slightly easier to manage, require little support, require substantial infrastructure investments, cannot work detached, have marginally lower management costs. We try to strive with a middle ground solution: EveryDesk is a locally executed OS, that when configured provides the same remote management advantages of thin clients without the costly infrastructure (the only thing needed is storage, that is nowadays cheap and plentiful). The system is a real install, not a live CD, so the user/administrator can install applications or customize it in depth simply by using the image and then replicating it for all the people working in a company or administration. Updating it is simple: just execute the Update Manager! Hospital worker: our initial use case. We designed the system so that national regulations in the handling of sensitive data could be complied to without any specific effort on the side of the user; that is, to make nearly impossible for the worker to lose or disseminate data without an explicit and voluntary breach of confidentiality, and make it possible to identify such breach immediately. By moving user data on a centrally managed server, standard logging and identity management techniques can be applied easily to prevent data loss; as no private data is on the key (including passwords), losing the key or having it stolen is not sufficient to breach the system privacy. For our health care customization we added to the basic image an excellent radiology workstation system called O3, already in use in some Italian hospitals, a medical dictionary and some ancillary tools like the ImageJ image processing system. Another important use case is widely found in developing countries, and is the “Internet Café”. While it is true that mobile internet access is fast becoming a fundamental infrastructure, cost and efficiency reasons still make it sensible to have a physical, shared space with PCs. EveryDesk makes it possible to provide low-maintenance PCs with no hard disks, a central low cost storage, and simply give away the USB keys to the attendees. If a key stops working, it is simply a matter of re-copying the image on top of a new one to restore everything. 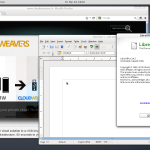 Within companies and Public Administration, providing a diskless PC with EveryDesk allows the efficient use of even old PCs (EveryDesk takes 150MB of RAM with both Firefox and OpenOffice.org open), while providing thanks to VirtualBox the set of applications that are not available within Linux. In dispersed companies, where you have multiple sites, you can use a replicating file system (like the wonderful XtreemFS developed within another EU-funded research project) that provides in a totally open source solution with differential and efficient replicas across sites. This way you can use your VirtualBox image, stop it, let the system replicate it in the other sites, move to another city, fire up EveryDesk again and have all your data and status restored without the need for local persistent storage. 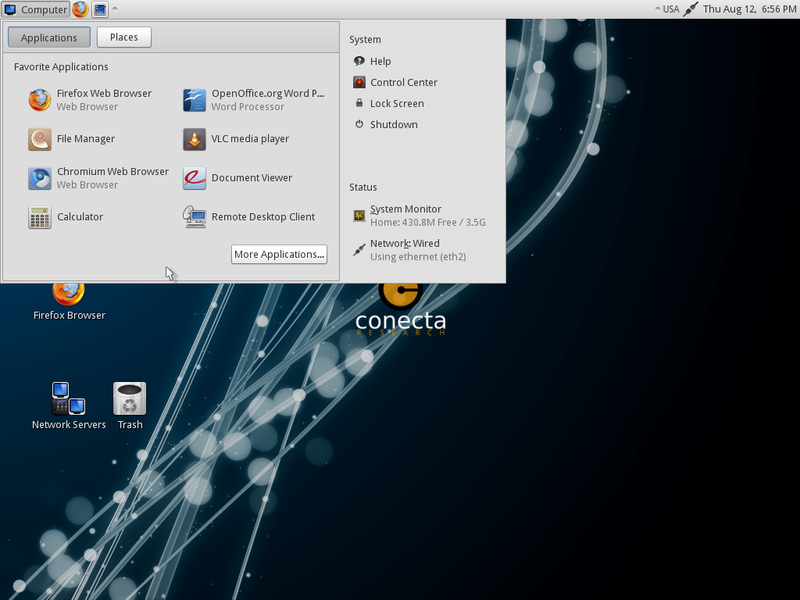 The idea of a real Linux install is not new – actually, some of the ideas were explored a few years ago in a Gentoo-based system called FlashLinux, that unfortunately is not updated since 2005. 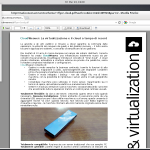 We also introduced some of the ideas behind IBM SoulPad, namely the integration of virtualization within the environment, but reversed the concept (in SoulPad the virtualization layer is at the bottom, and is used to abstract the internal virtual machine from the hardware, as well as providing easy suspend/resume functionalities). We plan to create a education-oriented edition, integrating some of the software tools already selected in projects like EduLinux; we also plan to backport some of the customizations of municipally-sponsored distributions like MAX (Madrid Linux) to try to provide a common basis for experimentation in public administrations across Europe.